If you are interested in joining us contact any of the officers in-game(Ayasu Lemieux, Celedh Knight, Yagrush Threepwood, Haldis Omholt, or Laude Valiquette). If you're interested in raiding with us, please use the Raiding Application link on the right side bar. Hey guys, it's that time again. Or for the first time for some of y'all! After looking over the rules page here on the forums, we kinda realized we hadn't updated the official Dimensional Death rules since like... 2013/2014. We've cleaned them up and turned them less into raid group rules, more into community guidelines. A lot of these are common sense, but if y'all could, please read over these, that'd be great. Thanks! Immediately following the Glamour Contest on Saturday, May 20th, we'll be holding an FC meeting to discuss our plans for Stormblood, as well as some housing related questions. The leadership have some things we want to address with the FC as a whole, covering some recent events and some ongoing issues. This meeting is not expected to go longer than an hour and a half, and will wrap up with a large group screenshot to celebrate our 10th year as a community. Back in the day in FFXI, we used to use the word "Mandatory" for these meetings, as we used a points system. This was to stress the importance of meetings like this. While we can't make you show up for this, we do really want to stress that this is a great time to air out any questions or concerns you have with the FC. We love getting feedback from everyone, but it happens so seldomly and we really would love to know how we're doing and what we could be doing better. Hey guys! Our next event is next weekend. It's gonna be a Glamour Contest! Let's go ahead and get right into the particulars, though! Theme: We'll have two categories! To celebrate Stormblood, we'll have a bit of a focus on the Far East! Category 1: Casual - do your best to show off your Far Eastern style! Category 2: Combat - Bring your best Samurai, Ninja, Monk or Red Mage styles! Rules: All costume submissions must be submitted by screenshot -- either by supplying your own, or by contacting Ayasu Lemieux in-game to take screenshots for you. If you submit your own, PLEASE make sure the lighting is good! Screenshots must be submitted by 11:59pm Pacific on Friday night. Costumes will be rated by our panel of Judges throughout the day on Saturday. Results will be announced during the walk-ons on Saturday. If you are not able to be there for the walk-ons, you will be disqualified. You can only submit an entry for one(1) category. You may do a walk on for both categories. All entries must be from characters on Excalibur. All participants must be available to do walk-ons on stage by 5:30pm Central. Why an hour before start time? So we can do a quick "rehearsal" for the main show! This will help solidify the order we walk on and *hopefully* reduce the amount of chaos, should we get a lot of entries. Note: These rules and prizes are subject to change. Edits will be posted and clarified! How to submit entries: There are a few ways you can get screenshots over to us. First, by tweeting @ayasumonk on Twitter. You can also shoot me an email using this link with the subject "DD10 - Glamour Contest". You can also submit via Discord by joining my Stream Discord and sending me a PM with the screenshot attached. As there are two categories, there will be two 1st, 2nd, and 3rd place winners -- one for each category. The prize lists for both categories are as follows: Due to low submissions we've combined both categories into one, and there will only be 1st, 2nd and 3rd place winners. Choice of 1 pet from the list below. Everyone else will receive 1 pet in the order they were scored by the judges. Everyone gets something! So, as part of the 10 year anniversary of we're really interested to hear -- what's your fondest memory of Dimensional Death? I understand that some may not have been with DD as long as other, but if you have any good stories to share, we'd be more than happy to hear it! from now and throughout the month of May, think of and post your favorite DD stories here. Whether it was an accomplishment, something silly, or just a stupid DD meme... or whether you joined us in FFXI, WoW or FFXIV-- we wanna hear it! Just reply to this thread in order to tell your story! Close to the end of May, we'll be gathering all these stories together and choosing some to record and make a sort of video tribute out of. If your story gets chosen, we may ask you if you'd like to record yourself reading out your story. If you don't want to, that's fine! We look forward to hearing about some of your favorite memories from Dimensional Death's 10 year history. If you read the subject line, or have heard me talking about this at all in the last month, then you probably already know that Dimensional Death turns 10 in May. This is a HUGE milestone, because a lot of online communities -- especially those focusing in MMOS, really don't seem to stay around that long. But, did you know that DD's history *actually* starts way earlier than that? 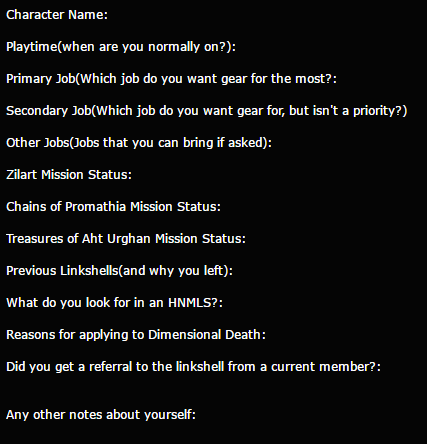 The community that would eventually become Dimensional Death originally spun off of the ShirtNinjaTravelAgency, or SNTA, Linkshell from FFXI. That Linkshell was founded sometime in November of 2003 after a long and dangerous low-level from from San d'Oria to Windurst. Originally founded with the spirit of exploration, I feel that now 14 years later, Dimensional Death still carries that torch. And that's when Dimensional Death entered the planning phases. Using the month of April, and beginning of May, a number of Dimensional Death's founding members got together and discussed things like rules, loot, and point systems. We tossed around some ideas, mostly based off improving flawed ideas of linkshells we'd been a part of. We wanted to try to make the loot systems as fair as possible -- to create an environment where the leadership gets no special rules surrounding loot. I won't go into a playbyplay full history of Dimensional Death(though, for me, at least, it would be a lot of fun! ), but I did want to go ahead and drop some fun facts. Right now, most of these are very much in the planning stages, but we're working to try to bring some things to you guys every week on Saturday for the month of May. As we get plans finalized, we'll be adding them to the calendar on the forums, as well as pinging the Announcements section of Discord.
? May 6th: "Walk Across Eorzea" - This is an event Tunod was already planning, but we discussed it and decided to go ahead and make it part of the DD10yr fun!
? May 13th: A Glamour Contest! - The overall theme for this contest is one of color: blues, purples, and black(DD's "guild" colors). We'll discuss if there are any sub-categories and announce them the week before the event.
? May 20th: Pre-Stormblood FC Meeting - This one is less "Fun," but on May 20th, we would like as many people as possible to gather together in the FC house so we can have an FC meeting to discuss our plans for Stormblood. Part of these plans include putting money aside for a new, LARGE house, as well as fielding questions and concerns anyone might have about the FC. If you have a question you'd like to ask, but want to do it anonymously, please use the SUGGESTION BOX.
? May 27th: Lowbie Run! - This is actually kind of an old, pre-DD tradition that got lost over the years after switching games, but... we'll be doing a lowbie run to celebrate the original spirit of exploration that drove us to create SNTA back in 2003. The current plans will to roll a level 1 character starting in Ul'Dah, and we'll run AAAAAAAAALLLLLLLLLL the way to the gates of Ishgard -- through a winding and dangerous route that'll take us through an Imperial stronghold! The route will be posted in the thread for this event. While all of these events are optional, I do ask that everyone please try to make it to the FC Meeting on the 20th, since that's nearly exactly 1 month from the official launch of Stormblood. If anyone has any other fun event suggestions we can do on other nights together, please let us know! Here's to 10 years of Dimensional Death, and many more to come!! Game DD was active in will be posted in 's before the link! 2011 - [WoW:Cata] Faction change! 2012 - [WoW:Cata] New month, new expansion, new changes! 2016 - [FFXIV:HW] Makin' a move! As you all know, Dimensional Death is coming up on our 10 year anniversary! As such, in order to breathe a little bit of new life into things, we've decided we're going to rebrand a bit -- make things a little more fresh, and feel a little more new! Nowadays, people are all about themes, so I got to thinking. What, in all of Final Fantasy, is the most beloved creature in the game? Especially in the MMOs? If you said Crabs... you're 100% correct! Everyone, welcome to Dimensional Crab! From here forward, we'll be going with a full crab-themed layout both on the forums, and especially on Discord. Have a crabby day, everyone! We'll be streaming on my Twitch channel, and anyone else on the team is encouraged to stream too -- we can get a multi-twitch thing going on! Could be fun! EDIT: APRIL FOOLS! Hope you guys got a laugh out of this year's. So, after talking to the officers, my roommates and ignoring my common sense, effective next week, we'll be shutting down Dimensional Death in FFXIV and we'll be making the move to Star Wars: The Old Republic! We're currently on the Shadowlands server, and we'll be using the name Blood Saber -- because, yanno, Empire and Sith and stuff. As we've all heard, SWTOR is making a comeback(lol), and is riding that Star Wars Episode VII Hype Train all the way to the station, so now is currently the best time to do so. For those who don't want to make the move to SWTOR with us, there is another option -- I heard about this game this morning, and since I know oh so many people just /love/ Hearthstone, this game is sure to make a splash! I bet it would totally net a couple hundred thousand subscribers or so. I've gotten an advance copy of the server list for this game, and we'll be playing on a server called Whisperwind. I heard it was named after that one card "Sylvanas Whisperwind" or something. Page created in 1.107 seconds with 110 queries.